Propel Bikes, the nationally know electric assisted bicycle shop, announced that Owner Chris Nolte, has been named 2015 Veteran Entrepreneur of the Year by the New York Small Business Development Center at its annual Entrepreneur Award Ceremony held in Saratoga Springs, NY. The best part about being a Iraq war veteran and owning an electric assisted bicycle business is witnessing our customers happily aid in lessening the U.S.' dependence upon foreign oil. 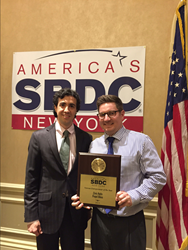 New York Small Business Development Center (SBDC) Central, the leading provider of technical assistance to small businesses fostering local and regional economic development through job creation and retention, announced that Propel Bikes’ Owner, Chris Nolte, won the 2015 Veteran Entrepreneur of the Year™ award on April 20, 2015. This coveted award represents New York’s most prestigious business recognition for veteran entrepreneurs. Nolte was honored for growing Propel Bikes into a highly-innovative, best-in-class electric-assisted bicycle business, and was also recognized for inspiring others with his vision, leadership, and achievement. Nolte began servicing bikes as a hobby in the late 1990's. This passion for bicycle rejuvenation carried over into 2011, when Nolte opened up his first electric bike operation in a small second floor office. In 2014, foot traffic along with sales continued to rise and after two moves to larger locations, Chris readily accepted another new adventure. Chris and his team saw an opportunity for growth and this May, Propel’s flagship store will open it’s doors along the renowned Greenway Initiative Bike Path in Brooklyn, NY. Nolte looks forward to bringing this exciting technology to a greater audience while continuing to support the cyclists who are presently participating in the transformation of the way we move. The Veteran Entrepreneur of the Year Award encourages entrepreneurial activity among those with potential, while also recognizing the contributions of those who motivate others through leadership and resolve. Nolte was distinguished as a high-growth entrepreneur who has demonstrated extraordinary success in areas including transportation innovation, customer service, and personal commitment to the business and community. To learn more about Propel Bikes, please visit Propel Bikes. To learn more about Propel Bikes’ history, please visit Our Growth.